Above: Brexit protest in London for the Put it to the People March, March 22, 2019. Photograph by Dan Kitwood-Getty Images. 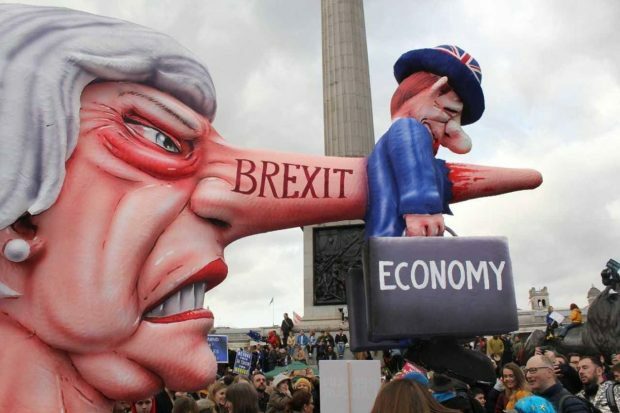 Brexit protest puppet from March 22, 2019. Photo by Angela Christofilou for The Independent. Brexit seems to be blowing up as a deadline nears for the British exit from the EU and before another crucial week for Prime Minister Theresa May that threatens her survival in office. There are reports that her ministers are organizing to remove her and predict she will be gone within ten days. Gina Miller of Lead Not Leave wrote,“Today’s truly epic march is testimony to the groundswell of public opinion turning against Brexit. A groundswell so great that it can no longer be ignored in a fully functioning democracy.” There had been suggestions that the march would be met by counter-demonstrations, but none in evidence. Tim Adams wrote: “There are still a few things in public life that you cannot fake. You can fake photographs and you can fake news. You can fake conviction and you can fake emotions. You can fake a Twitter-petition and you can fake Facebook outrage. 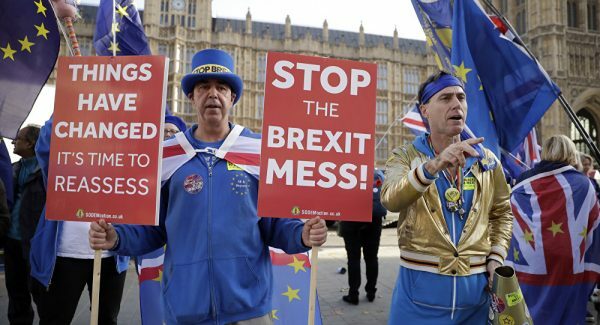 But you cannot fake an almighty crowd.” He said, “They came to London from across Britain and Europe, filled with enthusiasm for the new three Rs: revoke, remain, reform.” Two hundred buses from around Britain were booked to take people to London for the march. More evidence of the political backlash against Brexit came from an online petition to revoke Article 50 which will soon pass the 5 million mark and keep rising. Parliament is required to consider debating petitions that achieve 100,000 signers. Next week, Parliament is expected to attempt to take control of the Brexit process by holding a series of votes on different Brexit outcomes. Options could include the prime minister’s deal, revocation of article 50, a second referendum, a customs union deal, a deal-based single-market model nicknamed “common market 2.0”, a Canada-style agreement, or no deal. Jeremy Corbyn is calling for votes on four options – Labour’s alternative, common market 2.0, a customs union and a public vote – to see where a majority of Parliament is possible. Reuters reports that the Sunday Times cited 11 unidentified senior ministers and said they had agreed that the prime minister should stand down, warning that she has become a toxic and erratic figure whose judgment has “gone haywire.” They go on to report, “The end is nigh. She will be gone in 10 days,” quoting an unidentified minister. People are jockeying to replace her. De-facto deputy, David Lidington, is one contender to be interim prime minister but others are pushing for Environment Secretary Michael Gove or Foreign Secretary Jeremy Hunt. 1.8 million people marched against Brexit making it the biggest ever peoples protest in history, on the same day the #RevokeArticle50 petition became the largest. There’s a huge movement for a rethink on Brexit. Brexit is not a project of renewal – it’s a mess. This is the strength of feeling now. If Brexit happens, the anger and pain will be worse. Brexit Stop The Mess, Things Have Changed by Matt Dunham AP. The EU structure was designed to create a fractured public if ever any country’s population demanded withdrawal from the union. The true goal of the EU was to remove the essence of independence from these countries by melding them together economically. No country is sovereign without its own independent currency issued by its independent government. The architects of the EU knew this, and that was the reason they added unrestricted freedom of travel, employment, and elimination of tariffs between member countries. The EU Central Bank is the single sovereign over the monetary policy of all members of the EU. This constrains the national debt limits of the member EU nations and effectively makes the EU a single sovereign nation with each member being limited like a single state in the U.S. The stories about Brexit uniformly ignore this critical organizational feature of the EU.